Purpose: To create an atmosphere. The final team that needs consideration in the running of your Club, is one we are only just beginning to understand – the Microbiome or MicrobeTeam. Its importance to health is likely to prove immeasurable and yet its appearance is probably not even on most medical schools curriculum. The prediction I make however, is this will become a fundamental component of personalised healthcare for the 21st Century. What is different, what is uniquely special about Matchdays? Moreover, the real difference is the away fans, because they change for every game. I recently went to watch an Indian Super League game between FC Goa and the Kerala Blasters. The stadium was packed to the rafters, everybody was having fun, one big party on the terraces, with brass bands and popcorn sellers mingling amongst the crowd. Yet, there was something missing, something that changed the whole atmosphere, changed how I felt and perhaps, even changed how the game was being played. You see, there were no “Away” fans. The country is so big and the fans so poor, they simply can’t make it to the away games. Which is a great shame because they form an integral part of the experience we get from watching a live match. Yes, you may get the occasional hooligan fan causing damage, but, by and large, we enjoy listening to their songs and interacting with them. That’s because each set of fans brings something different to the game; different numbers, different colours, different chants, and different atmospheres. Contributing to our own enjoyment and arguably to the quality of the play. What you may find surprising however, is that your body is rammed full of more away fans, in the shape of bacteria, viruses, fungi, and parasites, than it is with the home support of human cells. We are outnumbered by at least 10-1, and in terms of genetic diversity you can make that 99-1. For every human gene in the body, there are approximately 99 microbe genes, representing all the different away fans we welcome to our stadium. Indeed, there is a lot of current research including; The Human Microbiome Project in America and the MetaHIT project in Europe focusing on metagenomics, otherwise known as environmental or community genomics. Which looks at how all the genes in a particular environment, not just human genes, interact. The picture rapidly emerging is one of many different genes, intercommunicating with each other, trying to find their position and role in life. Some are large, some very small in number, each seeking their own niche in the game to enable them to survive and thrive. As a result, we need to pay special attention to these visiting micro-organisms with which we co-inhabit the stadium of life, because as well as potentially causing diseases, they may also have a positive effect upon the way we play. Helping with the digestion of food, the release of micro-nutrients, the regulation of metabolism, the protection from environmental toxins and chemicals and even the training and development of our own ImmunoTeam, NeuroTeam and GenoTeams. There is increasing evidence of the importance of gut bacteria for health, and increasingly medical science is focusing upon the Microbiome to produce future treatments for many chronic conditions, both physical and mental. For example, studies of germ-free mice (no away fans) have demonstrated that they behave differently to mice with normal gut flora (bacteria), usually more active and aggressive, engaging in more risky behaviour, but less able to deal with stress and anxiety. Raising the possibility of pyschobiotics as the anti-depressants of the future. Studies of identical twins have linked obesity with gut bacteria, in particular a type called Christensenellaceae, which has been shown to be more abundant in individuals with a low body weight. Other studies have shown that babies born via Caesarean Section are more likely to suffer from allergy type diseases, like asthma and eczema. One theory for the recent increase in such immune-related conditions is that at the point of birth, the baby has very few bacteria (that’s why baby pooh is yellow), until it passes through the birth canal and is colonised by microbes residing in the mother’s nether regions. If the baby is born via a C – Section, however, it doesn’t get to play with these so-called pioneer bacteria, and the immune system doesn’t get stimulated and educated. This is also why cleanliness and the use of anti-bacterials is not necessarily good for your health and immune-system because the ImmunoTeam players don’t get the experience they need to learn and play well. These microbes predominantly reside in the Gastrointestinal tract (especially the large bowel) though they can be found throughout your body and depend on the food you eat for their own health. If you restrict your diet, you change the line-up of the MicrobeTeam, which can have an impact on how you feel, and your overall health. Studies have demonstrated, elderly people with a restricted dietary intake have less diverse MicrobeTeams and are consequently more prone to chronic diseases involving inflammation like, arthritis, type 2 diabetes and Alzheimer’s. Indeed, if one set of fans start to dominate, you often find trouble is brewing. Conversely, the fans of poorly supported lower league clubs can bring their own unique take to proceedings. One such comparatively scarce bacterium is called Akkermansia, which makes up no more than 5% of gut bacteria, but is very important in communicating with cells in your gut and the production of mucus. If the numbers of Akkermansia get too low, your mucus producing cells start underperforming and you can end up with a damaging, obesity-promoting inflammation. As Football supporters we should all rejoice the role of the ‘Minnow’ club, and its fans in particular, because they can teach us new songs and new ways of seeing things, and when taken as a collective, they have the power to change how we think, feel and perform in the game of life and are therefore fundamental to Premiership Health. If you still doubt the significance of your MicrobeTeam, perhaps, you are not aware of a medical treatment for Clostridium Difficile ( C. diff ), the infamous hospital-acquired infectious type of diarrhoea, blamed on the overuse of antibiotics, which kills nearly 2000 people every year in the UK. That treatment is called: Faecal Microbiota Transplant ( FMT ) or a stool transplant to you and I, which has been shown to be over 90% successful in curing the condition. Some experts even believe the MicrobeTeam is so important to a healthy life, they advocate the setting up of large scale “bio-banks” to be used in much the same way blood banks are used today. Unfortunately, many of our ‘Super’ Clubs today are failing to treat these guys with the care they deserve. We feed them junk food, washed down with sugar-laden fizzy drinks. We actively discourage them from attending the game anymore, preferring to zap them with pasteurisation and microwaves, herbicides, bactericides and pesticides, and finally, the ones that do actually make it to the match, get wiped out with antibiotics, and we wonder why attendances are falling! 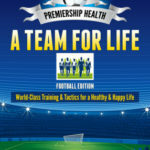 Premiership Health is about getting all your different players and teams that make up your ‘Super’ Club, playing well together, pulling in the same direction, interacting with the environment in a positive way and looking after the away fans, as well as the home support, to produce an entertaining and memorable game for all those involved.